For informal summer events such as fairs and camps Kaisa needed something light and comfortable to wear. An unboned bodice or "Jumps" is always easy and comfy, even on hot weather. I drafted the pattern based on Kaisa's stays, adding some allowance and removing some seams, ending up with single wide front pieces and a narrower back pieces. Jumps should in theory be cut with a straight front edge, I think, but I used curved front edge like in closed dress bodice fronts to give the garment more shape. The waist has several tabs, more than my own jumps but less than stays. 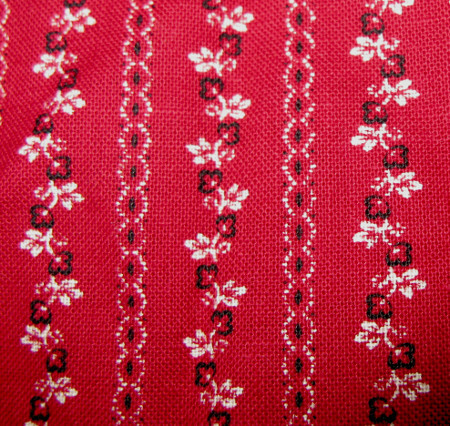 I had a cotton print apron I had bought a long ago, but I had never really used it. 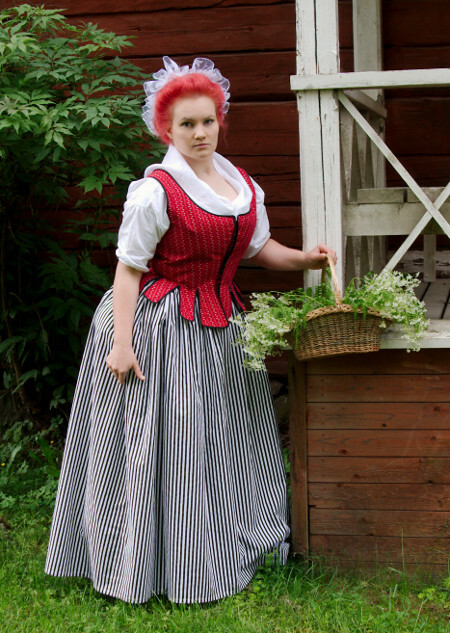 Red is one of Kaisa's favorite colors so I suggested the material for the top fabric. There was just enough for the jumps, as the wide waist tape could be used for shoulder straps. I lined the light cotton with coutil. It gives some body to the unboned bodice and keeps it from stretching in use. I made one mock up which needed some tweaking. The main problem was that Kaisa had recently lost some weight, but did not have much faith in staying in her current measurements for long. I decided to leave the jumps loosely fitting for now. This outfit was a quick machine job. First I put together the base layer of coutil, then the cotton top layer and stitched them together along the edges. Then I cut open the tabs. Before binding the edges I had another opportunity to try the jumps on Kaisa. I shaped the neckline a bit, but otherways it was pretty much ok.
As I was reluctant to take the time for hand bound eyelets this time, I tried the quick and dirty trick of sewing looped bands on the underside of the front edges. Hidden lacings are not unheard of on the period, I don't really know how appropriate it is in jumps but I doesn't hurt my eye that much (Much less than metal grommets, in any case!). Unfortunately I did not have enough material for a binding tape, so I used plain back bias tape. Like I had learned from my own pair of jumps it is possible to bind unboned tabs with a sewing machine as long as you are not overly perfectionistic about the final result. I also had the additional good luck to find a pretty and very cheap petticoat fabric. The narrow stripe goes well with the bodice colors, and I may some day be inspired to make a matching pierrot jacket for a bit finer wear. as you can see in the pictures, the jumps are definitely a bit too large and thus don't fit as well as could be hoped. The back length is also still too long even though I fixed it once already in the mock up. The lacing trick on the other hand works satisfactorily. Like I said, this outfit was very much a quick job, definitely far from my best works, but it serves it's purpose. I do like the cheerful combination of the patterns and colors which is also very much to Kaisa's taste.